Explains the procedure and ways to select an Income Tax Return or a Case, Change the bank information, and submit for refund re-issue. Postal check un-delivery, wrong bank information and/or other reasons may require a tax payer to change the bank and/or address information after eFiling is completed. There are 2 options to submit a request to re-issue the refund for a tax return or a case. The tax payer has the option to directly check the status of a relevant assessment year and submit the response. 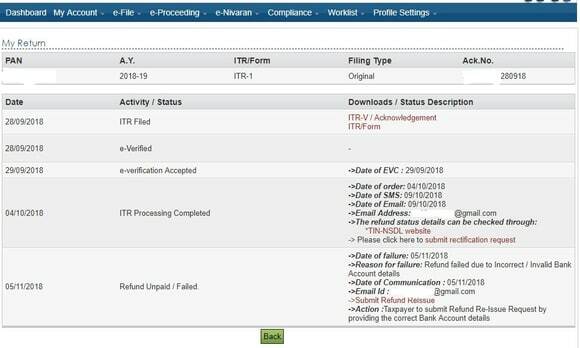 Your return status will be displayed like below image, Click on Submit Refund Reissue, which is highlighted in brick red colour. Refer the image for better understanding. Tax payer will get this screen after gone through any of the above options. Further click submit to go the next step. 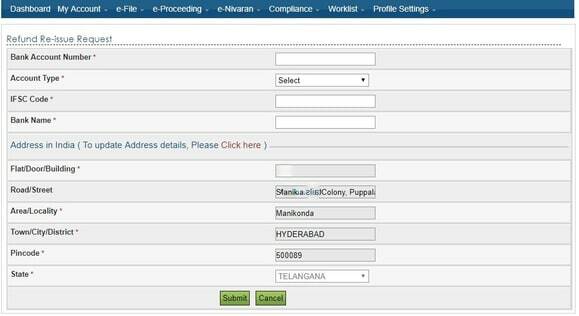 Upon successful completion of the previous step, tax payer now has an opportunity to provide the new Bank Account number, Account Type, IFSC Code. To submit the bank details, tax payer should e-Verify with any of the option provided, like Aadhaar, Bank account, or NetBanking. After completion of the process, ITD will process tax payers request and refund credits to the given bank account. If you need any assistance on Refund Re-issue, Refund Tracking and/or notice handling use EZTax.in Services.